The U.S. Bureau of Land Management (BLM) is out with new data on oil and gas leasing on federal lands—and it isn’t pretty. 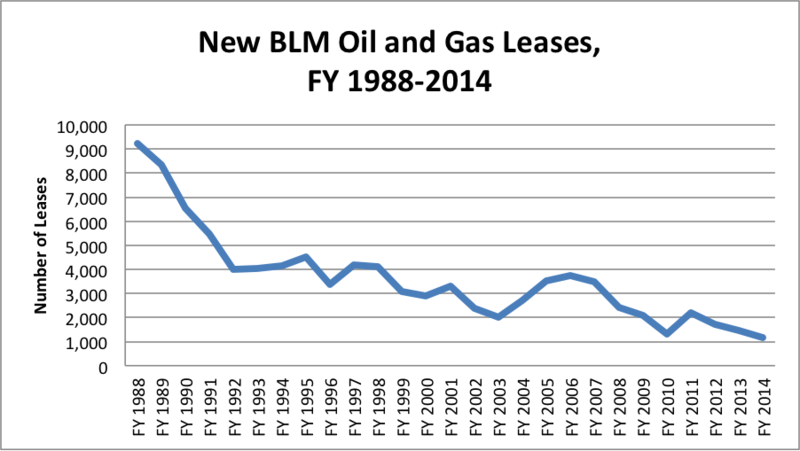 BLM issued fewer new leases in fiscal year 2014 than in any year since 1988 (though they leased slightly more acres than in 2013). The following chart shows how new BLM oil and gas leases dropped to 1,157 in FY 2014, a 26-year low that continues a long-term trend of depressed energy development on federal lands. As we have pointed out for years, BLM keeps most of the country’s federal lands off-limits to energy development. The agency also takes an inordinate amount of time to approve new leases: BLM takes more than 227 days, on average, to approve drilling permits, compared to less than a month for states like Texas and North Dakota—where, unsurprisingly, production is booming. As drilling permits languish in regulatory morass, production on federal lands is stagnant or declining. Oil output on federal lands grew by just 1 percent in FY 2013, while natural gas production dropped by 10 percent. The energy freeze on federal lands comes as America is in the midst of a remarkable domestic energy boom on state and private lands. Oil production has surged to 25-year highs, making the U.S. the largest combined oil and gas producer in the world. But those production gains are occurring only on lands in which the federal government isn’t responsible for leasing. The Obama administration has mostly avoided imposing new burdens on oil and gas development on state and private lands, but that could soon change. BLM is preparing first-ever federal regulations for hydraulic fracturing and EPA is gearing up to issue methane regulations for natural gas production. The continued success of the U.S. energy boom depends on keeping Washington bureaucrats out of energy development on state and private lands.